We are leading Manufacturer of Manual AAC Plants which are used for the manufacturing of AAC Blocks. Since these plants are operated manually, Manual AAC Plants require high labor count which leads to high labor cost. We are engaged in offering 10 CBM Manual AAC Plant. 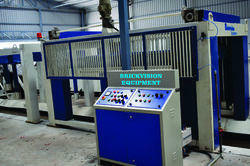 We are engaged in offering 17 CBM Manual AAC Plant. We are engaged in offering 30 CBM Manual AAC Plant.